My ultimate aim is to wirelessly network several Arduino based platforms with a centralized Raspberry Pi controller. There is much for me to learn to get this operational, not the least of which is the radio device I plan to use, the Xbee. To get up to speed on the Xbee, I found the tutorials at Adafruit, Sparkfun, and Parallax helpful. More detailed references are listed at the end of this post, but the very first challenge is to configure the XBee radios for operation. This post provides insight on how this can be done, and my main mission, create a few simple utilities that make that job easy. I purchased two XBee Series 1 Module (Freescale 802.15.4 firmware) from Adafruit. These are manufactured by Digi and are low-power module with wire antenna (XB24-AWI-001). They have a 250 kbps RF data rates and operate at 2.4 GHz. These radios use the IEEE 802.15.4 networking protocol and can perform point-to-multi-point or peer-to-peer networking , but as configured here, they do not mesh. The Digi models that handle meshing are Digimesh, ZNet2.5 and Zigbee (ZB). Digimesh is a version of firmware that runs on Series 1 hardware. So, if you choose to, you can upgrade these modules to Digimesh firmware to get meshing. DTR - "Data terminal ready" is a flow control pin used to tell the XBee that the microcontroller or computer host is ready to communicate. RTS - "Ready to Send" is a flow control pin that can be used to tell the XBee to signal that the computer or microcontroller needs a break from reading serial data. 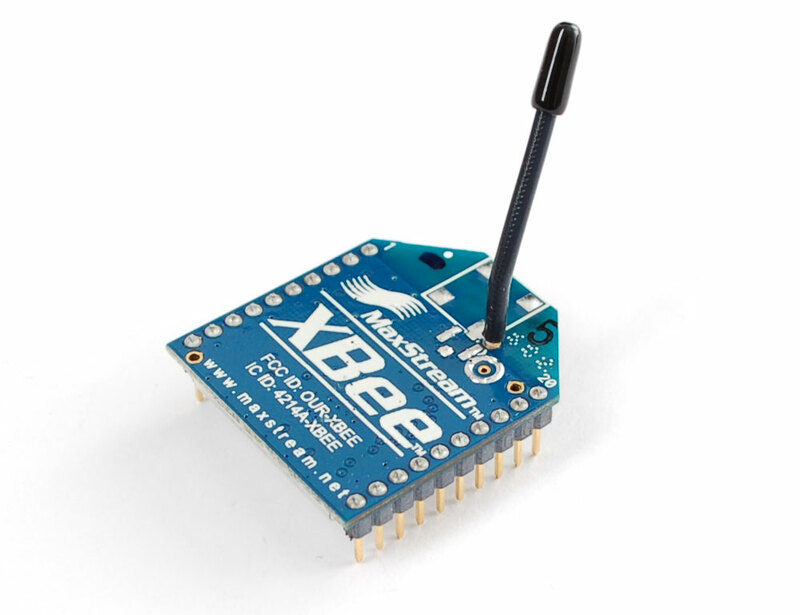 You need a way to communicate withe the Xbee, via it adapter, to set it up. This can be done via Adafruit's USB FTDI TTL-232 Cable, and the Digi X-CTU serial terminal program. By the way, the X-CTU user guide describes the many more things it can do beyond the configuration shown here. Plug in the USB FTDI TTL-232 Cable into a PC USB port. If drivers are not installed automatically (it didn't for me), follow the steps at the FTDI site. Download the X-CTU, double click on the executable file, and follow the instructions to install the program. Now connect the USB FTDI TTL-232 Cable to the Xbee Adapter as shown in the picture to the right and insert the USB end of the cable to you PC. Start the X-CTU. 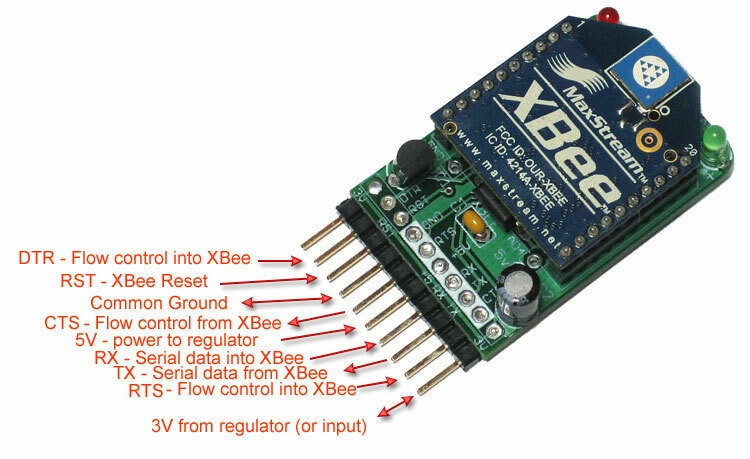 To connect, configure and upgrading the Xbee, follow the Adafruit instructions for the Xbee Adapter board. Note that if you follow the instructions (I didn't - I kept it at 9600 baud), the modem's serial interface is now set to 19,200 baud, not the default 9600 used by X-CTU. Remember this next time you use X-CTU with this Xbee. If your instructed by X-CTU to reset the Xbee, you can do this by shorting the reset pin, RST pin, to ground. The configuration can be touchy, it can go badly, or not at all. In my case, I seem to have one Xbee Adapter that can reliably perform a firmware upgrade but the other one took some time due to a lose fitting between the Adaptor and Xbee. If you run into configuration problems, check out these sites: Using XCTU to Invoke the Bootloader, The Unofficial XBee FAQ, How to recover from a failed firmware upgrade. The next step for me was just do a basic test of getting two XBee device communicating with each other. This is just a sanity test to see evidence of communication between the devices. Basically, I just followed the instructions provided by Adafruit. Using the X-CTU, set the PAN ID to the same value on the two Xbee's. Select an Ardunio that has been programmed to send repeated brief messages to its serial port. I used the standard LED Blinking sketch but put in some write statements in the loop. Using an Arduino and breadboard, connect +5V and ground to provide power. Make sure the XBee's LED is blinking. 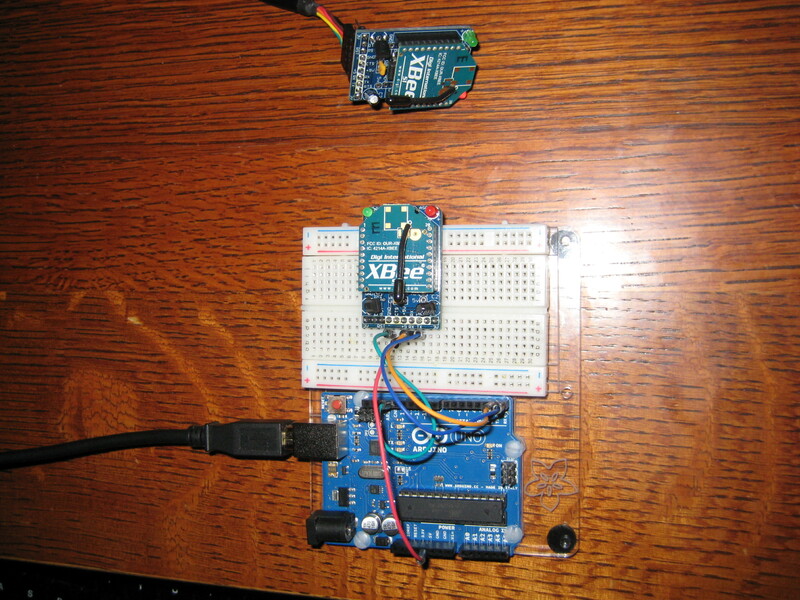 Connect the RX line (input) of the XBee to the TX line (output) of the Arduino. Connect the RX line (input) of the Arduino to the TX line (output) of the Xbee. Plug the Arduino into your PC's serial port. Now take the second Xbee and connect the USB FTDI TTL-232 Cable to the Xbee and the PC. The cable is doing nothing but appling power to the Xbee. Now you should see the receive LED periodically light on the USB FTDI TTL-232 Cable tethered Xbee. You now got proof that the two Xbee's are communicating. The Arduino connected Xbee is sending data to its serial port and the USB FTDI TTL-232 Cable tethered Xbee is receiving it. Above you'll find a picture of the configuration, and below is the Arduino sketch I used. *Turns on an LED on for one second, then off for one second, repeatedly. *Also increase brigthness of analog LED. * LED1 connected from digital pin 13 to ground. * LED2 connected from analog pin 9 to ground. * connected to pin 13, so you don't need any extra components for this example. While the MS Windows based Digi X-CTU tool is just fine, I want to use the RPi's and Python to access the XBee serial communication API, and its advanced features, for one or more XBee devices. I prefer simple utilities, that can be scripted within the Linux shell. Call me a Linux snob if you wish, but I don't care for MS Windows! In my post "Selecting XBee Radios and Supporting Software Tools", I referenced a Python package that could be used to create my utilitiesd, call python-xbee, and I will be using it here. It claims to provides a semi-complete implementation of the XBee binary API protocol and allows a developer to send and receive the information they desire without dealing with the raw communication details. It also claims the library is compatible with both XBee 802.15.4 (Series 1) and XBee ZigBee (Series 2) modules, normal and PRO. The interpretation of the output tells us the cable is attached to serial device /dev/ttyUSB0. See the output below. Another possibility is to use udevadm to gather information about specific devices but I never figured out exactly how to use it to answer my question. Python also has a package called PyUSB that might provide some help, but also here you'll still need the vendor and product identification information. Chances are that when you plug the cable into the same USB port the next time, it will default to the same tty but there is no certainty. To assign a permanent tty name to the device, and never do any of this again, check out Persistent names for usb-serial devices. The configuration and testing of the XBee's done earlier was done in AT Command mode (Transparent Mode). In AT mode, everything sent to the RX line of the XBee radio will be sent out via the antenna, and all the incoming data from antenna will go to the XBee's TX line. This is why we could check the sanity of the XBee radios in the earlier section, XBee Initial Configuration and Testing using a simple Arduino sketch. We sent junk to the XBee and it transmitted it! When sending a packet, the transmitting radio receives an ACK, indicating the packet was successfully delivered. The transmitting radio will resend the packet if it does not receive an ACK. The XBeeTerm utility will easily configure the XBee radios for API mode and set the appropriate network parameters. To get a deeper appreciation of configuring the XBee radios, see the References at the end. For here, I'll just run through the steps using the XBeeTerm.py tool and the configuration commands used, documented in file scripts. The yellow text is responses back from the XBee serial terminal and the red text is from the XBee radio itself. Since all the red text is "OK", all the commands took and the XBee radio is now configured as a Coordinator. Now repeat this for the End Device XBee radio. but for each End Device radio, increment the ATMY address by one (e.g. AAA2, AAA3, ...). What is API (Application Programming Interface) Mode and how does it work?